At this point, we all can agree something serious is going on with Tyrese. The outlandish crying videos and lengthy Instagram captions have been making headlines since law enforcement began investigating him over child abuse allegations. By the way, no charges were filed as the investigation has been dropped. However, Ty is still being weird on social media. Following his umpteenth crying video, the Fast & Furious actor posted about his “hero” Will Smith and his wife Jada Pinkett Smith being in his corner. 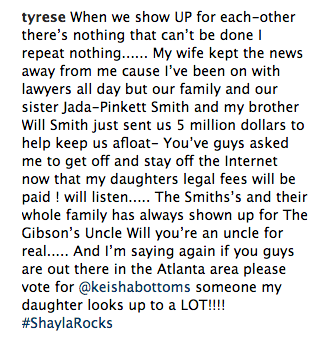 He went even further to say the Smiths gave him $5 million to help him stay afloat because he claims he’s broke. Well, according to sources close to the Smiths, this is the farthest from the truth. 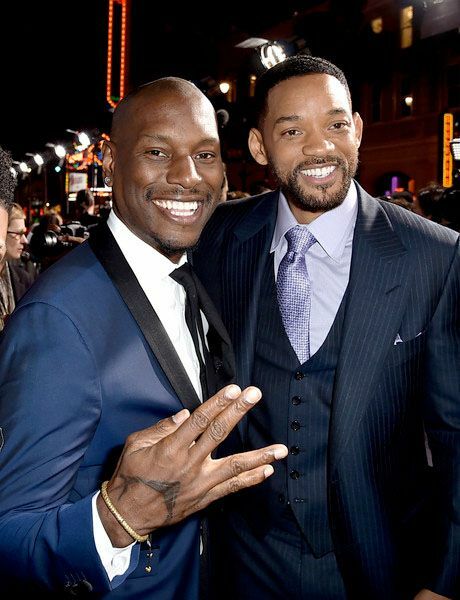 Said sources revealed Will and Jada have not given Tyrese any money at all. Hmm...what's really going on? Just another reason why we say someone in Tyrese's camp needs to take his social media away from him for a while until he gets himself together. He's doing the absolute MOST. On the bright side, Ty has squashed his beef with Dwayne "The Rock" Johnson and he's not leaving the Fast & Furious franchise. He better hope they don't kill him off on the next installment. Time to hit the gym...... When you Live and speak your truth you have to be willing to #AgapeLove on your haters and enemies - no one wanted to hire me, no one wanted to close deals with me false accusations have been following me for 10 years I’m not done yet but I’m almost at the finish line and the goal is my baby....... I’m headed to Abu Dhabi for the formula 1 races and to see my non judgmental family and to take a much needed break from America and the blogs - My wife gave me a complement this morning she said you need to keep that fire extinguisher with you cause more fires and accusations are potentially on the way .... ! told her no - Gods already protected me and if the devil shows up again ! will actually be so much more ready than what ! was at first....... Monday ! hope to get my baby back..... The first thing ! will do is apologize cause ! know me and her mother has created a lot of unwanted attention 10 years for Mommy only 3 months for daddy gets the hugs.... to my can’t wait!! FaceBook.com/TYRESE go there now please go there right now!! ( link in my Instagram bio ).. up those meetings bro...... #VoltronChairman #VoltronStudiosHollywood #VoltronTravel.com Romans. 8:31. What then, shall we say in response to these things? If God is for us, who can be against us? The good word says VICTORY IS MINE! !